If you struggle to read in low light conditions, the Alex LED Reading Light from Serious Readers is just what you need! If you’re over 40, chances are that you’ve noticed that your sight has changed over the last few years. You might need to hold packaging a little further away to read the small print, or maybe you’ve started to use reading glasses. And if you already wear prescription glasses, the words ‘bifocal’ or ‘varifocal’ may have been mentioned to you. I have to admit that I thought I’d be immune from this change as I’ve been shortsighted all of my life. But in the last couple of years I’ve noticed that I now have to take off my glasses to read small print. And I’ve also noticed that I can’t read as easily when the light is low. I’ll often have to take things over to the window to read, or move them more directly under my bedside light. This is a normal part of the ageing process, which comes to us all. But there are steps you can take to make life easier, like investing in a good quality reading light. Most people will find that they become more longsighted after the age of 40, even if they’ve been short sighted before that point. This effect is due to something called presbyopia. It’s a loss of focusing ability which is caused by hardening of the lens in your eye. It’s annoying, but a normal part of the ageing process. But as we age, we also lose some strength in the muscles that control our pupils’ reaction to light. This means that the amount of light getting through to the retina decreases, making it harder to see detail. So reading in comfort can become more difficult. You may notice some other changes in your eyes. Your eyes may start to feel drier as you start to produce fewer tears, especially in women after the menopause. And we also lose some of our peripheral vision as we get older. There’s not a lot you can do about the peripheral vision issue. But using a good reading light can certainly make reading in low light easier and more comfortable. Why choose a reading light from Serious Readers? Serious Readers have created a range of high performance reading lights. They’re perfect for anyone who notices that reading in low light is becoming more difficult. Their range of lights uses bespoke Daylight Wavelength Technology™, which projects a natural balanced beam of light. This light is close to natural daylight, which helps to maximise your ability to see colour and detail. Serious Readers lights don’t use short wavelength blue light, so there is less risk of damage to your sensitive retinas. It also reduces disturbance to your body clock, helping to avoid sleep interference. And Serious Readers lights are also designed with your posture and comfort in mind. If you’ve ever felt yourself subconsciously straining to see something more clearly, you’ll already know how our sight dominates our sensory perfection. The stay-put flexible arm and rotating joints mean that the lights can be set up perfectly for your requirements, taking the strain off your eyes. The Alex LED Reading Light range includes both desktop and floor standing lights, and you can choose either a sturdy heavyweight base or a lighter base. The heavier base gives more stability and a classic look, while the lightweight option is better if you are short on space as the base is smaller. There are a range of colour options to choose from, including black and white bodywork, and black, brass or nickel light fittings. You can even choose to have a dimmer switch fitted for an additional fee. The Alex LED Reading Light delivers high performance, but it keeps energy use down. An energy efficient 5.5w bulb is provided with your order, and replacement bulbs are available from the Serious Readers website. The light is built specifically for your order, and is sent out to you in a substantial cardboard box to keep it well protected in transit. And your Alex LED Reading light is ready to use as soon as you unpack it. When I unpacked my Alex LED Reading Light, I was immediately impressed by the quality of build. I’d opted for the heavyweight base, and it felt really solid and high quality. A simple instruction booklet is provided, but as the light is shipped fully constructed, there’s no self-assembly needed! I had decided not to request a dimmable light, so my light came with a simple on-off switch. As with the light, the switch feels solid, and the carrying handle makes it easy to move around. I put my light in my office, where I work both at my desk and in my armchair. 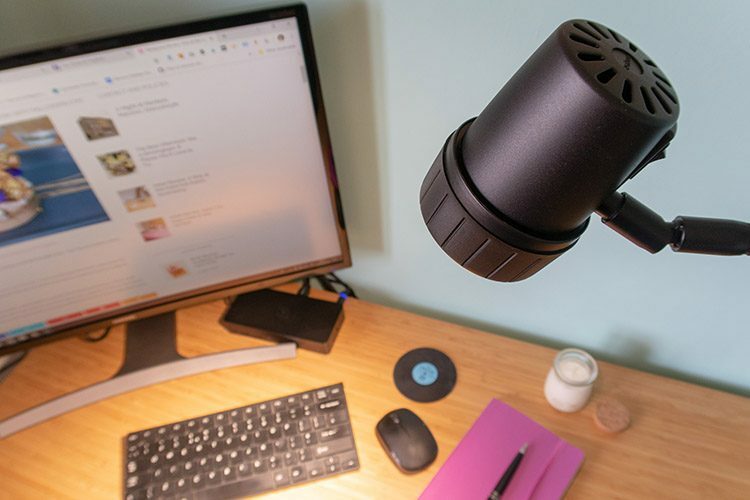 The adjustable stand meant that it was easy to find a comfortable angle for the light, and the swivel head means you can direct the beam of light exactly where you need it. I was really impressed by the illumination given by the light, which was bright but without any glare. And the true daylight colour of the bulb is excellent – I hate lights that are either very blue or very yellow. I’ve been very impressed with the Alex LED Reading Light. It’s excellent for both reading and for other close up work. I’ve certainly found it invaluable for sewing badges on to my son’s cadet uniform! The light is bright but not glaring, and the colour of the bulb is very close to daylight. It’s certainly good if you are trying to match colours either in print or on screen. And the light looks good, with a design that is both modern and classic. The quality of the build is excellent, and I love that I don’t have to do any self-assembly. The Alex LED Reading Light from Serious Readers starts at £219.99 for the table lamp and £269.99 for the floorstanding light. If you want your light with a dimmer switch, there is an additional charge of £30, and delivery in the UK costs £9.95. And with a 30 day risk-free trial and a 5 year guarantee, your Alex LED Reading light comes with peace of mind as well. This may seem like a lot to spend on a reading light. But I think it represents a good investment for anyone seeing the effects of age on their eyesight.